Your networks have spent the past year boosting Donald Trump and giving him mostly unfiltered access to your megaphones. You've consistently covered Trump's tweets more thoroughly than his legal scandals, his attacks on vulnerable communities and his conflicts of interest. And you've moved quickly since Election Day to normalize the new administration. But this isn't normal. We need an adversarial press more than ever. We urge you to hold Trump accountable. Donald Trump wants the press to be nicer to him — but that isn't their job. We need to know: Is the media going to hold Trump accountable? The first sign of a fascist government? The disappearance of a free press. On Nov. 21, top TV news journalists and network executives met for an “off-the-record” meeting with Donald Trump. Trump's hostility to the media is well-documented. He attacks any reporting that isn't overwhelmingly favorable toward him. He hasn't held a real press conference since July. He's banned reporters from covering events and ditched the White House press pool. Even more disturbing: This strategy is working. Trump is controlling the narrative and using his tweets and insults of the press to distract from his frightening appointments of white supremacists, his shady business deals and his incessant attacks on our democracy. In the Nov. 21 meeting, ABC, CBS, CNN, FOX and NBC all went off the record with Trump. Now they must go on the record with the public and tell us how they will respond not just to attacks on the media but to threats to our democracy. For far too long the mainstream media have valued preserving access over challenging those in power. That needs to end now. 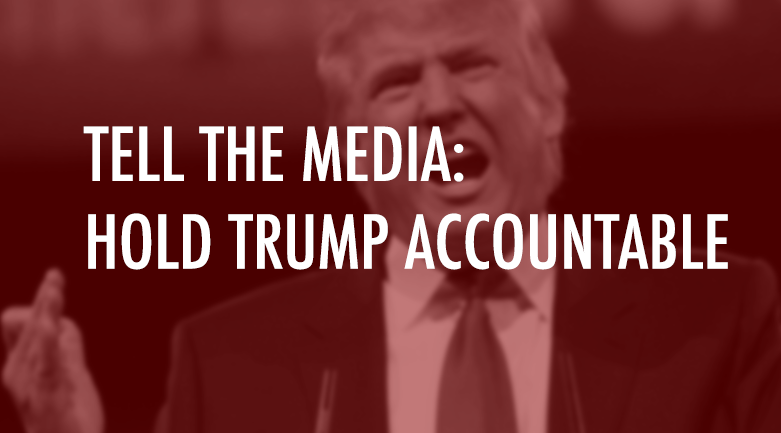 Urge TV news networks to stop giving Trump a free pass and start holding him accountable.